Purple, nice. Mint, plums, wintergreen on the palate. Very interesting. The palate is fresh, young and tannic. Blue fruits, sasparilla and cedar dominate. Fine-grained tannins are evident but not overwhelming. On the mid palate I get a strong blueberry component along with cedar. The finish is short to medium in length and offers blue fruits, gentle tannins and some mild acidity. This wine is rather basic, bland and thin. It offers short term pleasure but is not age worthy. Drink now. 88 points and 2 stars for this $50 Third-growth Margaux. Salut…. Oops, I’ve done it again, infanticide on a young bottle of red. 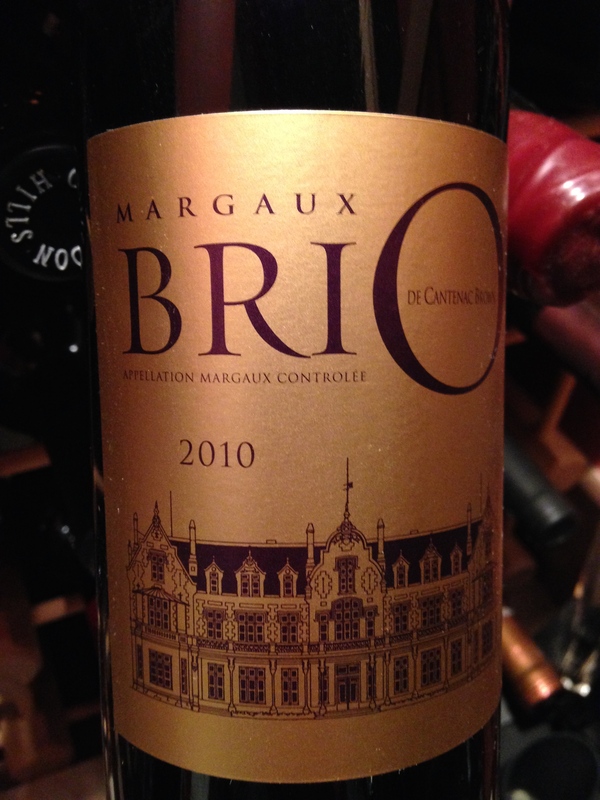 The second wine from Margaux property Cantenac Brown, it has good potential and high marks from several pro’s. Beautiful purple fruit nose that transcended plums, violets and blueberry notes. Still young with juicy strawberry and cranberry flavors on the initial attack that cloak the greenish tannins. Sour cherry kirsch on the mid palate leads into a long finish of cherry crumble and blueberry tart. A touch of oak here and there amongst the acidity. 88 points from me and 3 stars for this $40 effort. A blend of Merlot, Cabernet Sauvignon and Cabernet Franc. Definitely cellar this for more pleasure, 2016-2022. Salut…. 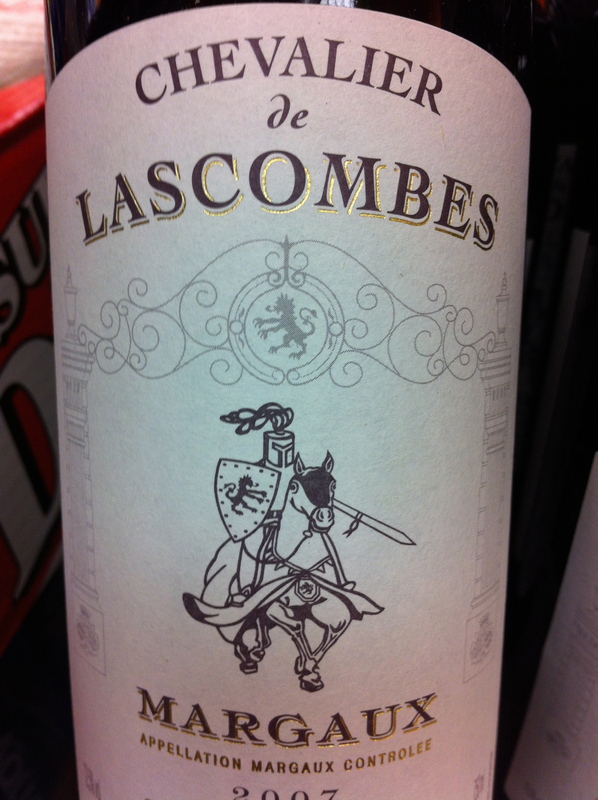 This is the ‘second wine’ of a ‘Second Growth Bordeaux’. I’ll save you some time if you are unfamiliar with these terms. In 1855, the Bordeaux wine region classified the best (read expensive) wines into 5 top levels, or Growths. The First being the top notch wines, all the way down to the 5th. There are 14 Chateau in the Second Growth tier. When the winery makes its wine in barrel, sometimes the quality is not as high as required for the main wine. This could be because of new vines, poor weather or whatever reason they deem. These slightly inferior wines are then blended into the ‘second wines’ and sold at a considerable discount from the main wine. The principle wine from a Bordeaux Classed Growth winery usually has a long aging potential, and as a consequence, it is not drinkable or mature for many years. I find that most Growths are unapproachable for the first 10 years of their cellaring. The ‘second’ wines are not made in the same method and mature much earlier. Whilst they don’t have the same aging capacity, they are drinkable much sooner. I digress…. This wine is delicious. Dark purple in the glass, it offers up some spiciness in addition to the black berry and earth I got on the palate. Very smooth tannins are on point and the balance is great. The finish is long on this one, and it leaves you puckered up for more. 2007 was not the greatest vintage, but the pedigree of this wine is evident. It may be the ‘second’ fiddle but it hits all the right notes for a Margaux wine. I would imagine 90 points from a pro, I’m giving it 4 stars. Delicious on its own, it would pair well with Duck, Beef stew or Braised Lamb.